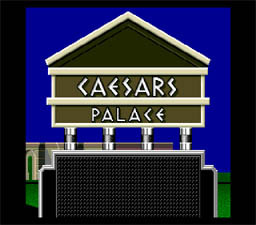 Welcome to the fast-paced casino capital of Las Vegas, Nevada -- home of the premier casino, Caesars Palace! Now you can sharpen your skills and practice your poker face in the privacy of your own home with your Sega Genesis and the CAESARS PALACE cartridge. Filled with the most popular games, CAESARS PALACE has everything a High Roller could ask for: Blackjack, Roulette, Craps, Keno, Slots, Video Poker, and Video Horse Racing! 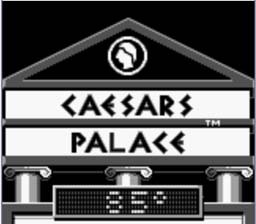 --From the Sega Genesis Caesars Palace instruction manual. Caesars Palace is all about gambling, and the great thing about it is that you don't have to hate yourself for losing $5000 dollars. 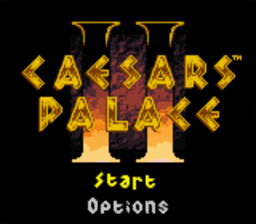 Caesars Palace contained 5 different games, and very detailed sound effects! This game made you feel like you were actually at the table, the odds were highly realistic! Another good add-on to this game was the videos to teach beginners how to play each game. A great game for the gambler in all of us. You pull up to Caesars Palace in a taxi as a big gambler. You are welcomed at the window and informed that you have a $1000 credit with the casino. After the clerk retrieves your chips, you are then set free upon the casino to rake in the MONEY!!! This is one of the earlier games for Gameboy. This is given away by the black and white graphics, which are a little pixelated, but still not that bad. The games included are the Slot machines, Roulette, Black Jack, Video Poker, and a game similar to Roulette, but it has a bigger wheel. It has little MIDI-tones playing for the background music. It's a good game to pass the time with when you're bored or waiting for a big file to download and you have nothing better to do. This game really is a hand-held casino. Well, at least when it was on the Gameboy. Now it's a desktop casino. There are enough games on here to keep you busy for a while. There is Big 6, Roulette, Black Jack, Baccarat, 6 kinds of slots, 4 kinds of poker, 4 kinds of video poker, and no one can forget Keno. It has the same quality of graphics as the first one, but this one is in COLOR. You have the spunky MIDI-tones for background music, and then the appropriate sound effects: swishes for the cards, money falling for the slots, and other stuff like that. If you get good enough, you get invited to the High-Rollers section. Make sure you have a lot of time when you start playing this one, because it can become addictive. If you love to gamble but are intimidated by all the high-rollers and the bright lights of Las Vegas, then SUPER CAESARS PALACE is the perfect game for you. 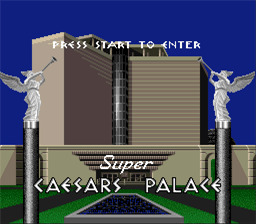 The essence of the world-famous casino has been beautifully translated for the Super Nintendo, offering nine different games. You can spend all day playing Video Poker, Blackjack, Slot Machines, Roulette, Craps, Keno, Red Dog, Horse Racing, and Scratchers. If you find yourself running low on cash, you can access any of the ATMs scattered throughout the vast casino. And if you are hanging out with Lady Luck, you may just find yourself in the VIP Room, where youll rub shoulders with high-stakes gamblers and maybe even become one! You dont have to take out that second mortgage or sell your car to test your "foolproof" system in Vegas with SUPER CAESARS PALACE; you dont even have to leave the comfort of your own home!